Information, free downloads, links, and expert commentary on bullying, parenting, conflict resolution, and character education. 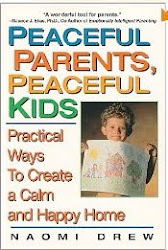 Great source for teachers, parents, school counselors, and youth group leaders. We welcome your comments! I'm going to be talking about the proposed "Anti-Bullying Bill of Rights" that's expected to pass in New Jersey. This excellent bill is designed to protect kids from harassment, intimidation, and all other forms of bullying. It will also help our schools and colleges become places where all kids can learn in peace and safety. To learn more about this very necessary and timely bill, click here and read my Examiner article. It has all the details plus a link to the bill itself. Kudos to my home state of New Jersey for crafting a bill that could very well serve as a model for the nation. Together we can stamp out bullying, and this bill is a wonderful step in that direction. A side note: the Fox News segment will be posted on their site hopefully by Sunday. Okay, please indulge me while I brag just a little because I'm too excited to keep this too myself: my publisher just informed me that No Kidding About Bullying has been nominated for the Association of Educational Publishers' Distinguished Achievement Award! This is such a wonderful honor, and so I'm happy just to have my book nominated. (If I sound like I'm at the Oscars, remember, you're indulging me here.) Anyway, the winner will not be announced till June. I can't believe I'll have to wait nine months to find out, but I've given birth to two kids, and they took nine months to get here, so I guess I can wait nine months for this too. By the way, if you're using No Kidding About Bullying, please let me know how it's going. How are your kids responding to the sessions? Is there a particular part of your day where you fit the sessions in -- morning meeting, health, social studies? Do you have a favorite session? I'd love to hear from you and your kids. By the way, New Jersey (my state) just came up with the most amazing anti-bullying legislation. See my article in the Examiner for details. Yay, New Jersey!! We really do lots of things right! I was so excited about this review of No Kidding About Bullying that I had to post it here. When you read it you'll understand the significance of the above picture. Many thanks to Books That Heal Kids for this amazing review! Every month I get together with my fellow elementary school counselors in my district to do curriculum planning and sharing. I believe the exact quote when I introduced this new resource was, "This book is FULL OF AWESOMENESS!" If you are going to spend money - do it on this one. You will not be disappointed...you'll be empowered. In the picture above I have tagged just about every activity there is in my copy. I'm pointing this out because sometimes when I buy curriculum...I am only able to use a few of the activities (which is upsetting to both me and my wallet). I'd use ALL 125 activities in No Kidding About Bullying. I must say....I'm impressed. And let me tell you, it takes a lot to impress me. One of the lessons I've used with students is called - Basement or Balcony? It's about using the highest or the lowest part of who we are. After the lesson, the teacher of the class came up to me and said, "As you were teaching your lesson. I was working on my weekly newsletter to parents and I started typing what you were saying. I love it and am going to ask parents to please use this concept and language at home because we will be using them here." When teachers love your lessons - jackpot. 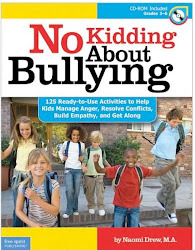 A few more of my favorite lessons from No Kidding About Bullying are: A Get-Along Classroom; Leave It at the Door; Creating Your Place In Other People's Memory Banks; Peace Shield; Using Think Alouds; Responsibility vs. Blame; Basement or Balcony? ; Staying in the Balcony; Staying Respectful with Someone You Don't Like; Unhooking from Mean Words and Actions; Don't Get Stung by Zingers; and The Courage to be an Upstander. And these are just a few....I pretty much love them all. They are having a solid impact on our students and giving me a whole new world of language to use with kids. I also like how author Naomi Drew has put the lessons together. They are EASY to do and I really dig the language she uses for discussions. She's making me a better elementary school counselor! As you know, I love all of my bibliotherapy and these activities can be a good companion to the books I use. However, I've also been able to fill up a 30 minute lesson just using an activity on it's own. 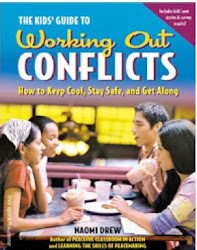 And hear me out, this guide is not just for school counselors it's for teachers too! I'd really love to get No Kidding About Bullying for all of the 3-5th grade teachers at my school. It's a major community builder and a wonderful approach to building student relationships. My school year just got a lot better! Are you using No Kidding About Bullying? Which sessions are you finding particularly useful? How are your kids responding? Please post a comment here and let me know. A Legislator Speaks Out Against Bullying - So Powerful! Please take a moment to view Fort Worth Councilman Joel Burns speaking out against bullying in the most courageous talk you may ever see. We desperately need more people in the public eye like Mr. Burns. His speech such should be required viewing in schools and communities across the country. Please take a look and leave your comments here. Were you ever bullied as a child or teen? I was, and just about every adult I've talked to admits that they were too somewhere along the way. Did you ever bully anyone else? I did. I was mean to my younger brother and still feel guilty about it to this day. Bullying someone else is a harder thing for people to admit, but doing so can be the beginning of helping a child who bullies stop. Bullying can be an ever-repeating cycle: the person who's bullied bullies the next person, and so on, and so on. And each person in the bullying cycle is adversely affected by it, including those who simply watch. Bullying can have a devastating affect all the way around, and as we've seen in the heart-breaking events of the past month, it's affects can be lethal. So, what can we do? Starting now, starting today, we can bring the issue of bullying out of the shadows. Talk about it with your friends and family. If you're a parent, and you were bullied at some point, let your kids know how it affected you personally. Or if you bullied someone else, talk about that too. Or, perhaps you were affected by seeing someone else being bullied -- this is another important discussion to have. Whatever your experience with bullying, talk about it, and encourage your kids to talk about their own. Conversations like these can open many doors. They can provide you with knowledge about your child you previously didn't know. They can also open the channels of communication about a topic that remains hidden in so many kids' lives. And more importantly, conversations like these can enable you give your kids critical information about bullying. Let's all take part in National Bullying Prevention Month by not only having these critical conversations, but by also speaking up on behalf of anyone who is bullied, discriminated against, or treated in a cruel manner. If more people had spoken out on behalf of Seth Walsh, Billy Lucas, Asher Brown, Justin Aaberg, and Tyler Clementi, the five teens who died this month in bullying-related suicides, they might still be alive today. If your child is being bullied, take a look at this excellent information from Stop Bullying Now, a project of the United States Health Resources and Services Administration. 1. First, focus on your child. Be supportive and gather information about the bullying. Never tell your child to ignore the bullying. What the child may “hear” is that you are going to ignore it. If the child were able to simply ignore it, he or she likely would not have told you about it. Often, trying to ignore bullying allows it to become more serious. Listen carefully to what your child tells you about the bullying. Ask him or her to describe who was involved and how and where each bullying episode happened. Learn as much as you can about the bullying tactics used, and when and where the bullying happened. Can your child name other children or adults who may have witnessed the bullying? Empathize with your child. Tell him/her that bullying is wrong, not their fault, and that you are glad he or she had the courage to tell you about it. Ask your child what he or she thinks can be done to help. Assure him or her that you will think about what needs to be done and you will let him or her know what you are going to do. If you disagree with how your child handled the bullying situation, don't criticize him or her. Do not encourage physical retaliation (“Just hit them back”) as a solution. Hitting another student is not likely to end the problem, and it could get your child suspended or expelled or escalate the situation. Check your emotions. A parent's protective instincts stir strong emotions. Although it is difficult, a parent is wise to step back and consider the next steps carefully. 2. Contact your child's teacher or principal. Parents are often reluctant to report bullying to school officials, but bullying may not stop without the help of adults. Keep your emotions in check. Give factual information about your child's experience of being bullied including who, what, when, where, and how. Emphasize that you want to work with the staff t school to find a solution to stop the bullying, for the sake of your child as well as other students. Do not contact the parents of the student(s) who bullied your child. This is usually a parent's first response, but sometimes it makes matters worse. School officials should contact the parents of the child or children who did the bullying. Expect the bullying to stop. Talk regularly with your child and with school staff to see whether the bullying has stopped. If the bullying persists, contact school authorities again. 3. Help your child become more resilient to bullying. Help to develop talents or positive attributes of your child. Suggest and facilitate music, athletics, and art activities. Doing so may help your child be more confident among his or her peers. Encourage your child to make contact with friendly students in his or her class. Your child's teacher may be able to suggest students with whom your child can make friends, spend time, or collaborate on work. Help your child meet new friends outside of the school environment. A new environment can provide a “fresh start” for a child who has been bullied repeatedly. Teach your child safety strategies. Teach him or her how to seek help from an adult when feeling threatened by a bully. Talk about whom he or she should go to for help and role-play what he or she should say. Assure your child that reporting bullying is not the same as tattling. Ask yourself if your child is being bullied because of a learning difficulty or a lack of social skills? If your child is hyperactive, impulsive, or overly talkative, the child who bullies may be reacting out of annoyance. This doesn't make the bullying right, but it may help to explain why your child is being bullied. If your child easily irritates people, seek help from a counselor so that your child can better learn the informal social rules of his or her peer group. Home is where the heart is. Make sure your child has a safe and loving home environment where he or she can take shelter, physically and emotionally. Always maintain open lines of communication with your child. By the way, if it comes to light that your child is bullying, click here for some very helpful information. The three bullying related-suicides of the past week are an urgent wake-up call to all of us. That Rutgers student Tyler Clementi, Asher Brown of Houston, Texas, and Seth Walsh of Tehachapi Florida all took their lives in incidences of gay-related bullying is a glaring signal that something is seriously wrong in our society. Where was the compassion in all of these cases? Where was the conscience? Where was the sense of responsibility? All missing apparently. We MUST -- all of us -- start fostering in our kids a higher degree of compassion, respect, acceptance, and responsibility than ever before. And we must start living these values ourselves. The senseless deaths of these three young men makes it more critical than ever that we do so now. And we must remember this: Tolerance for all people needs to modeled, taught, and unconditionally expected. - Be aware not only of your words, but of the subtle gestures that communicate how you feel beneath the surface: body language, tone of voice, facial expression. The slightest role of the eyes can send an unspoken message of disapproval, dislike, or disdain. - Talk with your kids about bias, prejudice, and homophobia. Let them know that it’s never okay to judge another person based on a difference -- even though it happens all the time. Ask them to imagine belonging to a race, religion, culture, or other group that faces discrimination. Ask how it might feel to be judged harshly due to some perceived difference, and not as the person you actually are. Consistently guide your kids to know that prejudice in any form is unacceptable and inhumane. * I’m uncomfortable hearing that. * I don’t find that funny. * Please don’t make comments like that. * Hey, we’re all human beings, and we all deserve respect. * I know you said that in jest, but I find it offensive. * With all due respect, that comment was demeaning. * Whoa! I didn’t need to hear that. - Remember this: any word or action that puts someone down is not acceptable. For example, the word “gay” should never be used in a pejorative manner. Doing so opens the door to future acts of bias. The deaths of Seth Walsh, Asher Brown, and Tyler Clementi will not have happened in vain if we all begin with these steps, and continue until not one more young life is lost because of intolerance. May our children learn -- beyond the shadow of a doubt -- that inside every person lives the potential of the entire human race. We are all necessary, and we are all of value, regardless of our differences, or perhaps, because of them. Click on covers for more details.